Before people arrived in New Zealand, more than 80% of the land was covered in forest. When Māori came, around 1250–1300 AD, they built dwellings, canoes and forts from wood. They also burnt large areas of forest. Europeans exploring New Zealand in the 18th century saw the trees as ideal for making ships’ masts. Later, traders came from Australia and Britain to get timber. 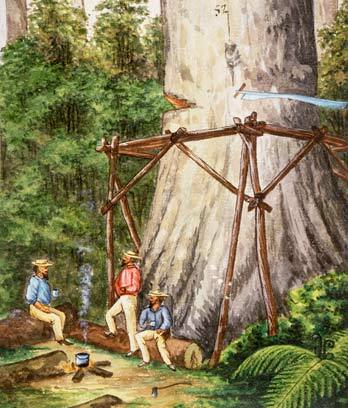 Kauri, with its huge, tall trunks, was a favourite, but kahikatea, rimu and tōtara were also logged. By the mid-1830s, about a third of the European men in New Zealand worked in the timber industry. Timber became one of New Zealand’s main exports. As Europeans settled in New Zealand from 1840, they needed wood for houses, fences and firewood, and later for railway sleepers. They also cleared the forest so they could build towns and farms, burning trees as well as cutting them. In the 19th century, teams of ‘bushmen’ lived in camps in the forest, cutting trees. They worked long hours, and Sunday was their only day off. Sawmills were built near forests and on the coast, and towns grew up around the mills. Some timber was exported to Australia, Britain and the Pacific Islands. Because the native forests could not provide enough timber for building, forests of exotic trees (mainly pine) were also planted. In the mid-20th century, the government realised that native forests had not regrown as expected. They wanted to reduce cutting of native trees, but there was a building boom after the Second World War, so the logging continued. In the 1970s, the government was still logging native trees, but conservationists thought forests should be saved. There were protests against logging forests in the central North Island and on the West Coast of the South Island. By 2005, only about 25% of New Zealand was covered in native forest. Logging had stopped in the government’s native forests. Only some trees in privately-owned forests could be cut. Most of New Zealand’s timber now comes from non-native forests, or from overseas.